Keeping up with my annual tradition, I present this year's recap of the Year in Review. This QnA comes by way of my friend, Aimee, who saw it on a blog called, All and Sundry; that writer "borrowed" this from her friend,Gwen. I'm sure this goes further back to others, but that's far enough for me! I've been doing this recap since 2008. It's a great way to reflect on what's happened and gives me a chance to think about the new year about to unfold before me. 1. What did you do in 2012 that you'd never done before? Lived in a different state! We officially lived in New Jersey for a full year. I also biked 65 miles from Philadelphia to Atlantic City in the Irish Pub's 25th Annual Tour de Shore Charity Ride. I got to be on television, doing a cooking demonstration segment on a local television station, CBS 3 Talk Philly. In addition to now being a "TV Chef", I'm also in a video and in a print brochure for ExtraordinaryED, an education learning center in Collingswood. I've been interviewed for some local newspapers and I'm trying my hand at getting back into teaching cooking lessons. Saw my name and writing in print, in a major magazine. I wrote a "In Your Words" essay answer to REAL SIMPLE Magazine and my submission was picked to appear in their August 2012 magazine. I still have people mentioning to me that they saw my story! 2. Did you keep your new year’s resolutions, and will you make more for next year? In general, I do not like to make resolutions, they are too easy to not keep. 3. Did anyone close to you give birth? Babies, Babies, BABIES Everywhere! We have a new nephew in the family, Jaxson, who was born on January 2nd. Our good friend, Roberta, had Kristina in March. A friend who I met during the 2010 SheRox Tri had a baby boy, this summer. A friend from the neighborhood, who I met through someone at my job, had her third child, a boy named Cash, on October 17th - which is Nate's birthday! There were lots of others too, but these are the kids that stand out most for us. 4. Did anyone close to you die? In my line of work, at a synagogue, we lose a lot of members each year. Fortunately, we didn't have any close friends or family pass on this year. 5. What countries did you visit? Still haven't left the USA, not since 2007. I did get out of state and beyond the tri-state area though! I managed to go out west for a long weekend, visiting with my bestie, Rachel and her new husband, Jim, in Tucson. 6. 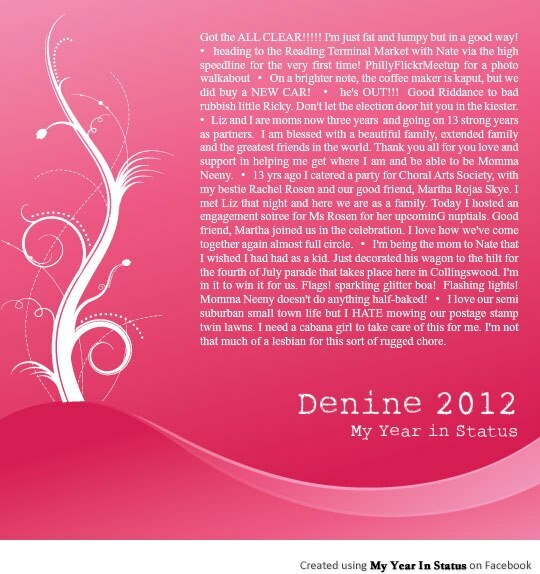 What would you like to have in 2013 that you lacked in 2012? Hmm, we seem to have a lot, and not just material possessions. I consider myself to be very fortunate, lucky and loved. I can't say that I want for much. 7. 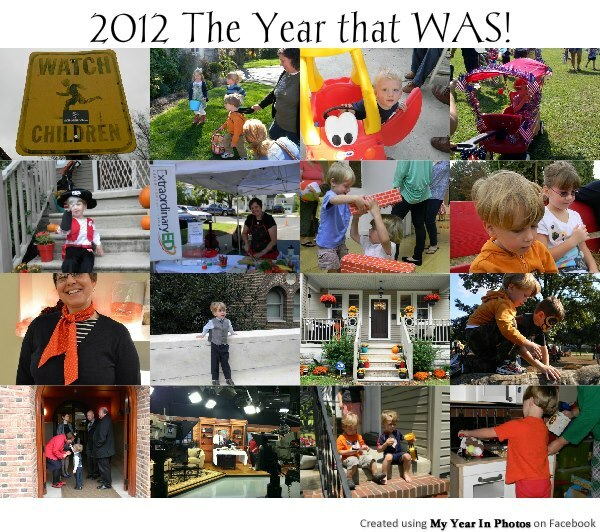 What dates from 2012 will remain etched upon your memory, and why? The biggest date is October 13th, the day my best friend, Rachel got married. That entire week actually will be etched in my memory. From picking her up at the airport and driving without head lights on in Center City until a Cop flashed at us! Driving she and her soon-to-be husband out to Norristown to get their marriage license at the last minute; getting our nails done and the brunch we all shared on South Street, meeting her new family of in-laws; the rehearsal dinner party at Panorama Ristorante. Being her bridesmaid. It was a day long in coming and one of the happiest days in which I've ever been proud to participate. The entire month of October stands out, actually! After the wedding, we had Nate's 3rd birthday and his party. Then Hurricane Sandy hit the East Coast. While we were spared any and all damages from the storm, we lost power (and a bit of foodstuff) for 2 days. Luckily, we had gas for cooking, hot water and our gas fireplace. May 20th - the Sunday we participated in Collingswood's town-wide open house and garden tour event. 100's of people came to see our house. It was one of the crazier things that I've ever done, entertaining so many people, all day long! 8. What was your biggest achievement of the year? Biking down to Atlantic City; making time to bike in the early morning from April to September. I've been lazier about biking and because we live further from Center City, it's a bit trickier to get up that much earlier to bike. 9. What was your biggest failure? Not exercising enough! Same as last year! Not reading or writing more. Not writing thank you's to people, or letting others know I appreciate them enough. 10. Did you suffer illness or injury? Hurt my knee, again, biking. Hurt my back, AGAIN, hauling my heavy, single speed, steel frame bike, which was loaded up with an elaborate picnic, on the 5th Annual Tweed Ride back in November. But that was worth my back spasms! 11. What was the best thing you bought? Our new car! Well, thanks to Liz's dad, we have a new car. We are officially, a two-car, two-car-garage, semi-suburban family. 12. Whose behavior merited celebration? Barack Obama. I said this in 2008 and I'll say it again. He's a fine man. Maybe not the best president we've ever had, but he's a good man and wants to do right for our country. 13. Whose behavior made you appalled and depressed? And I've been saying this since 2008 - the G@d damned Old Party. The radical right has become so out of touch and insane that I cannot even bring myself to say more than that. All the shooters and mass murderers. Way too many shootings in 2012, but none more depressing and senseless than the killings that happened in Newton, CT. G@d rest the souls of those children, educators, parents, friends and loved ones. 14. Where did most of your money go? Bridge Tolls and Train fare! Real Estate Taxes and our Mortgage. Towards the wedding - a dress, a tux rental for Nate. Baby sitters. 15. What did you get really, really, really excited about? Living in Collingswood. Getting involved with ExtraordinaryED and all the cooking/teaching opportunities I've had with them. My tv spot. 16. What song will always remind you of 2012? I'm so out of touch with music these days. I like that crazy song, Gangam Style by Psy. So darn catchy! c) richer or poorer? Hmm, financially speaking, about the same, but w/less disposable or net income. In spirit, richer. In friendship, richer. In love and family, richer! 18. What do you wish you'd done more of? Writing, reading, biking, sleeping. 19. What do you wish you'd done less of? Eating! Driving! 20. How did you spend Christmas? Christmas is a long affair, mostly because Liz has a lot of time working at church. Nate got sick two days before, so we weren't sure what was going to happen. I drove him to church for our annual Christmas Eve Dinner with our church family. He was too sick to stay for the pageant, but not too sick to play for a bit. Having the second car allowed me to drive out and come home as we needed. Nate slept on the couch while I put his toys together. It was a touch and go night with him, feverish and throwing up. We all got little sleep. I spent 2 days cooking! Christmas day he woke up at 5 am, not because he knew it was Christmas and that Santa brought him toys, but because he couldn't sleep. We came downstairs, found his new toys and played for a bit, before we all fell asleep on the couch for a few hours. From 10 am until 7-8 pm, we entertained guests, family and visitors. It was a very merry, albeit, sick holiday, full of love, toys, cookies and tissues! 21. Did you fall in love in 2012? Nah, but I'm still in love with Liz and Nate! 22. How many one-night stands? AHA!! This was the missing question that I couldn't figure out from the first time I wrote one of these q and a's. None. And this will be the last time this ever appears here! 23. What was your favorite TV program? I am such a TV JUNKIE. Pawn Stars. American Pickers. American Restoration. And then we discovered Downton Abbey in the late Fall. Like 5.4 million American Viewers, we are hooked. Dame Maggie Smith is beyond hilarious. 24. Do you hate anyone now that you didn't hate this time last year? I don't hate many, but I did "unfriend" a number of people on Facebook as well as blocked a lot of people, mostly due to politics and the 2012 election. 25. What was the best book you read? Dearie, the biography of Julie Child. Though, I haven't finished it. 26. What was your greatest musical discovery? None. I love music, but I just don't spend my time and money on music the way I did 15 and 20 years ago. 27. What did you want and get? A new car and house! 28. What did you want and not get? It's always about bikes for me. I bought a new to me, used bike. Otherwise, I didn't want for anything. 29. What was your favorite film of this year? Feh! Like with music, I don't have time for movies. Liz bought HUGO for me, and it took us a few months to get around to watching it. That is a good movie, well worth another viewing. I'm still waiting to watch The Artist! I think the dvd is still in the original wrapper. We tend to watch a lot of the same animated movies with Nate, over and over again. 30. What did you do on your birthday, and how old were you? I turned 45 this year. As the years roll by, I forget more and more what we did to celebrate it. I think we went to dinner. I'm sure we had a nice evening. I'm just glad I'm healthy, we have a nice home and our son is doing well. 31.What one thing would have made your year immeasurably more satisfying? Having more time off and more sitters (and money to pay them) so we could do more fun things! 32. How would you describe your personal fashion concept in 2012? Same as ever, preppy sporty, classic. I'm happy I didn't have to buy many new things even though I'm not nearly as slim and trim as I was a few years ago. 33. What kept you sane? Blogging. Biking. Coming home to the new house and it's loveliness! 34. Which celebrity/public figure did you fancy the most? Daniel Craig. We watched The Girl with the Dragon Tattoo. I melt when I see this manly, rugged man. Really. No lie. 35. What political issue stirred you the most? I'm so sick of politics. I'm grateful the election season is temporarily over. 36. Who did you miss? My grandmother, Faye. Though she's now been gone for a year and a half, I still think of her all the time and miss her a lot. 37. Who was the best new person you met? Since moving to Collingswood, we've been blessed with meeting many new lovely people. We are now friends with Donna and her adorable daughter, Bella, who is one of Nate's girlfriends! Lesley and her 2 girls and new baby son. I got reacquainted with a college girlfriend from 25 years ago. Even though we only knew each other briefly back in 1987, we've managed to form a new and much stronger friendship this past year that is far nicer and much more real than when we were young women. 38. Tell us a valuable life lesson you learned in 2012. TRY. Take risks. Stop being jealous of other people. Just because someone else has done something doesn't mean you can't as well. What you will do will be different. 39. Quote a song lyric that sums up your year. Banana, Banana, Banana. Hey! Ripe and Green. Banana. Everybody Like It! Banana! By the Aggrolites. If it wasn't on Yo! Gabba Gabba, I don't think I know any new music! "Cream" of Broccoli Soup - VEGAN!